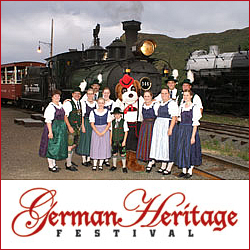 The German Heritage Festival is Colorado’s Front Range celebration of German Heritage, Food, Drink, Music, Kickers, and more! This year the celebration event takes place in Golden. This rain or shine event will feature authentic German music, food, bier, festivities, and more. Tickets are discount in advance and children 12 and under are free! Have a wonderful time at the German Fest Denver! Presented by German Fest Denver – Helga’s German Restaurant – and the Colorado Folk Arts Council.